As part of the “Biz on Biz” series—where local business owners give us tips about favorite products or services at other businesses—we stopped by Zumbach’s Gourmet Coffee on Pine Street. Doug Zumbach behind his coffee shop’s counter. Credit: Catherine Gorey. Owner Doug Zumbach’s spotlighted design solutions for “unique and different” Christmas gifts, elm for the popular restaurant’s selection of pasta dishes and Family Britches for its menswear. 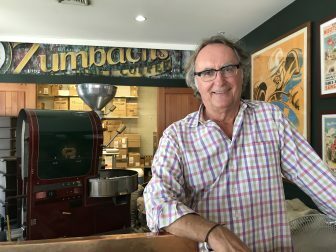 “Family Britches is a great store, with a nice owner, ” said Zumbach, who opened his eponymous coffee shop in 1992 and offers 30 varieties of hand-roasted brews. 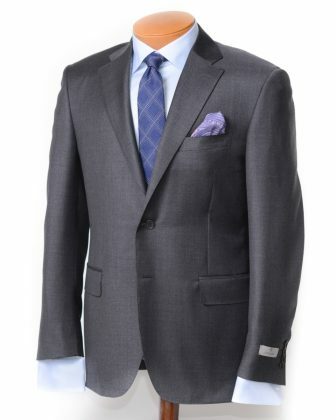 Canali grey suit from Family Britches. Mark Gust, manager and buyer for Family Britches, said that the line of hand-tailored, Italian suits is one of the Main Street store’s most popular items. “They’re an updated traditional suit,” Gust said. Love this feature of businesses promoting other businesses!